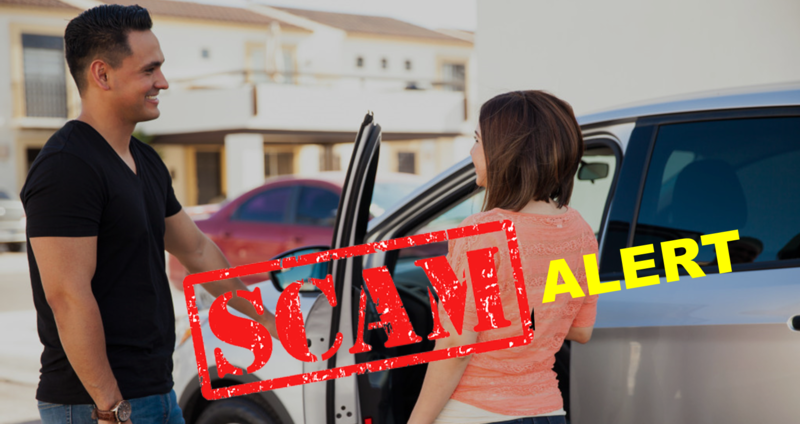 We’ve heard about various scams with ride-sharing occurring overseas, and airports in particular are hotspots for such activity. It’s nothing new—the taxi industry worldwide is also plagued by such fraudulent behaviour but stories of it in Malaysia haven’t been exactly common, at least not in the case of ride-sharing. However, a Vulcan Post reader contacted us with a story of his own experience with a Grab driver scam, and this is what went down. He arrived back at the KLIA airport and wanted to get home. James (*not his real name) loaded up the Grab app, requested for his ride, and was matched with a driver. According to the app, the driver was only a few minutes away. To ensure that his driver really was close by, James made a call to check, and this is where things started going off-course. The driver confirmed that he would be there shortly. He also asked James if he could pay by cash instead of by card. James, being an obliging fellow who only had going home on his mind, agreed. After waiting for about 5 minutes, James decided to look at his Grab app to see where his driver was. To his surprise, the Grab driver’s car icon was actually getting further away from the airport (Kajang, to be precise). He called again, and was reassured that the driver was on the way. Then, he received an SMS from an unknown number. Screenshot of the text message. 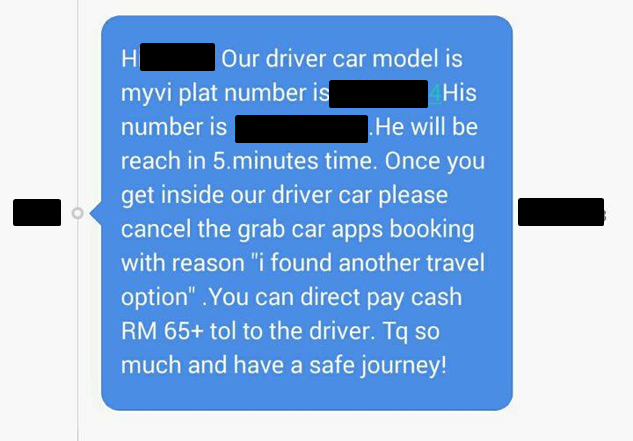 Puzzled by the message, but still not overthinking it, James did eventually find the “myvi” referred to in the text and got into the car. Once he was in, he received a call from the same number that SMSed him to check if he has been picked up. The same caller also called the driver after that to check if James was in the car. 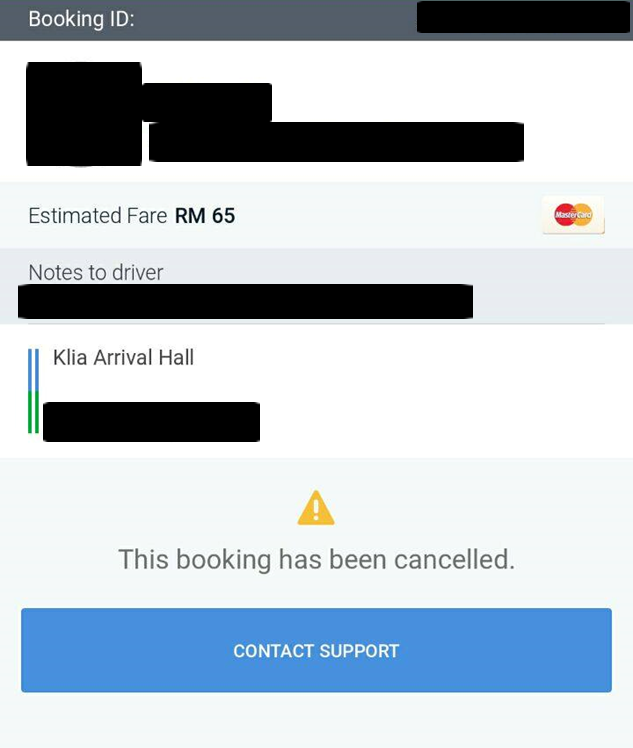 At the end of this ride, James paid the fare (RM65 and the toll), was dropped off safely, and very much confused. He also wasn’t given any receipt. It’s very likely that this scam is operating to allow for the drivers to use Grab’s services to find passengers without needing to pay a cut of their earning back to Grab, which would be the case if they were using the app legitimately. We haven’t heard any other reports or have any idea of how long they’ve been operating and we’re also very curious about how many people have even used this backdoor service. Obviously, they do have a system in place: from requesting for cash payment, to sending the text message with the driver’s details, and even the double-confirming with calls to both the passenger and the driver once they’re in the car together. Grab, on the hand, doesn’t know what’s happening behind the scenes and receives no part of this transaction. They’ve ended up supplying the scammers with the passenger pool but have nothing in return. “As the region’s leading ride hailing app, Grab’s main objective is to provide comfortable, safe, convenient and above all affordable rides to passengers whilst also considering the welfare of our partners, our Grab drivers. As such, we do not tolerate such scams that violate our passenger’s trust in our app and service. Such scams also encroach on the income and livelihood of our hard-working partners who have viewed us as a viable source of income. All our drivers have been through stringent training and checks and are consistently encouraged to outserve our customers. We are investigating the feedback and action will be taken against those who are part of such schemes, which includes permanent removal from our system. We want to caution all ride-hailing users to always be careful and in the case of Grab, to please book via the app, that way we can intervene and assist. Therefore, we want to urge all our passengers to exercise their right to safe and affordable transport and reach out to us via our customer hotline or email address (1300 80 5858/support.my@grab.com) should they come across a similar situation, so we can intervene and take the necessary action. In addition to that, Grab also hopes to introduce a credit system at the end of the year. To any prospective passenger who might be caught up in this, don’t get into the car. Grab insurance and policies (or whatever other ride-sharing company) can only put in guarantees as long as you’re using their app. If anything happens to you after you get into the car, you won’t have any form of protection or insurance. Keep in mind: no one is tracking you, no one knows your whereabouts, Grab has no information about the driver. You’re essentially in a stranger’s car with no safety net. Also, as a passenger, you really have nothing to gain by going with these guys. After all, it’s not like the fare is any cheaper for you. It’s possible that Grab in particular is targeted as the ride-sharing app of choice as A) They’ve always had the cash option, and B) They’ve always had a fixed fares option. Uber now does have these options, but Grab has had them in place for quite a while. As this is the only case we know of thus far, we don’t know exactly where this is going on, but it’s likely that airports would be targeted as there’s now a known fixed-fare rate for travellers who wish to get there or leave from there. This scam exploits the fact that there is a cash payment option available for ride-sharing apps, but simply removing that feature wouldn’t make sense. After all, even if Grab prefers for users to stick to credit cards, sometimes systems fail and having cash to fall back on is better for users. Perhaps instead, if Grab and the other ride-sharing apps move towards their own in-app credit system that allows users to preload credit into their accounts for payment, scams like this will find it harder to get a foothold in the industry.